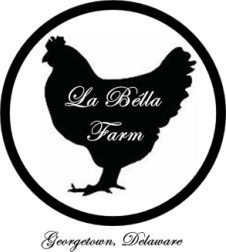 La Bella Farm was started in 2009 by Laura Marie Kramer. Laura Marie was raised on her family farm in Jarrettsville, Maryland where she raised dairy and beef cattle, chickens, turkeys, pigs, horses and grew produce. She was actively involved in 4-H and FFA. In 1988 Laura Marie started to grow and sell strawberries to help fund a family vacation to Disney World. 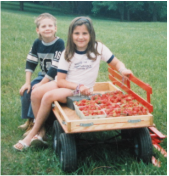 Utilizing a red wagon as her farm stand she sold strawberries at the end of her families farm lane. In 2009 Laura Marie moved to Georgetown, Delaware and started La Bella Farm. Focusing on cut flower and potted plants during the first two years, the farm expanded to included produce, laying hens and a flock of Hog Island Sheep.